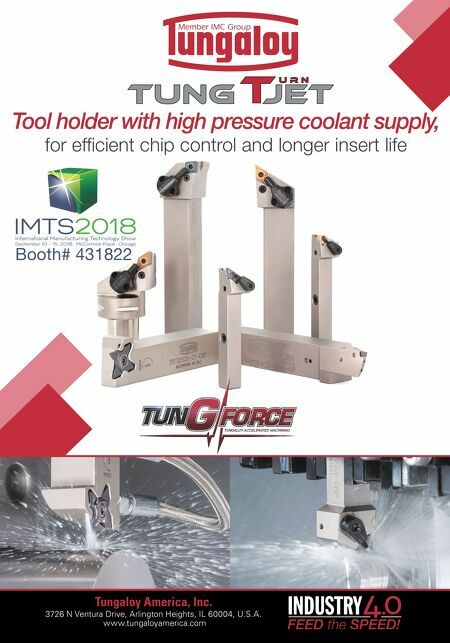 MMS AUGUST 2018 198 mmsonline.com IMTS 2018 Cutting Tools and Tooling Drill Series Enables Accurate High-Speed Machining Kyocera Precision Tools' DRV Magic Drill series of index- able drills is designed for holemaking in the automotive, aerospace and medical device industries. The series combines a CVD-coated insert on the outside cutting edge and a PVD-coated insert on the inside cutting edge. This enables high-speed machining and drilling precision. The insert chipbreakers improve chip evacuation, and the holder's thick center core provides rigidity. The series can reach depths from 2×D to 6×D and includes diameters ranging from 0.625" to 1.000" and from 14 to 32 mm. Four chipbreaker designs cover a range of machining applications. The inserts are designed with four usable cutting edges to reduce machining costs. The outside insert cutting edge has a U-shaped design that provides smooth chip evacu- ation and produces compact chips that reduce chip clogging. The inside cutting edge has a spoon-shaped design to reduce cutting forces for smoother chip evacuation even at 6×D drilling depth. The holder body's flutes provide a large web thickness. A high-rigidity holder body with low cutting resistance provides stable indexable drilling. 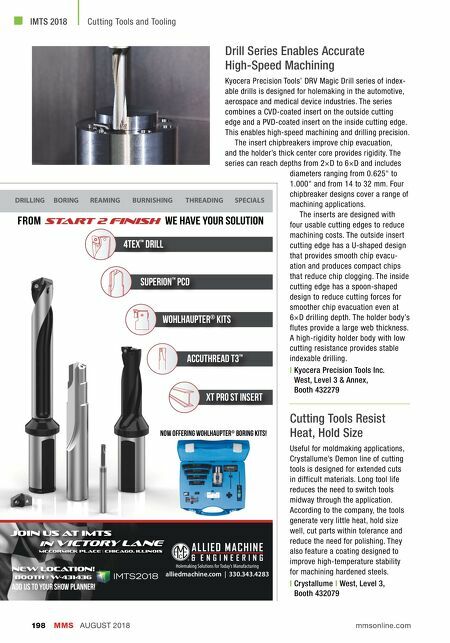 | Kyocera Precision Tools Inc. West, Level 3 & Annex, Booth 432279 Cutting Tools Resist Heat, Hold Size Useful for moldmaking applications, Crystallume's Demon line of cutting tools is designed for extended cuts in difficult materials. Long tool life reduces the need to switch tools midway through the application. According to the company, the tools generate very little heat, hold size well, cut parts within tolerance and reduce the need for polishing. They also feature a coating designed to improve high-temperature stability for machining hardened steels. | Crystallume | West, Level 3, Booth 432079 DRILLING BORING REAMING BURNISHING THREADING SPECIALS Join us at imts in Victory Lane NEW LOCATION! BOOTH # W-431436 alliedmachine.com | 330.343.4283 mccormick place | chicago, illinois xt pro st Insert start 2 finish Wohlhaupter ® kits accuthread t3 ™ superion ™ pcd 4tex ™ drill Now offering wohlhaupter ® boring kits! Add us to your show planner!